I am hurriedly stuffing a duffel bag with caftans, and cover-ups, and swirls of fabric in riotous colors. My new gold flip-flops, swimsuits, and the powerful sunblock I just bought (to celebrate my being almost-40!!) follow. Because I’m a responsible adult, I tuck in a mini medical kit…nothing impressive, but definitely inclusive of pain-killers, antihistamine, and band aids (don’t panic fellow-parents, my kids will get a more extensive one). Tickets…check. Resort booking…check. Keys with my mom to water the kaffir lime plant…check! Even if it’s only February I can feel summer is on its way. The air is warm (ok, the air is mostly warm over here), the skies are sunny, and there is this little bit of hopeful excitement in the air. Days when I still had summer vacations (oh, enjoy them while you still have them young ones!) are long, long gone, but the same thrill remains. Even if I know I will have nowhere the amount of carefree, sun-kissed days ahead of me, I still can’t help feel the promised-filled and golden-hued happiness of summer. The summers of my youth meant the beach. Living on an archipelago, it comes as no surprise that the season would see droves heading for the thousands and thousands of miles of coastline these islands are blessed with (over 36,000…more that the United States…#4 in the world!). I remember the sunblock-sticky days when I was a child. The slight sting of sunburn, the coolness of the cream my mom slathered on it. Picnic lunches that tasted good even if it was just those (scarily synthetic looking, wildy addicting) red hotdogs…with drops of seawater on your back and sand on your feet, anything tasted good. The feeling of the wind and sea spray whipping my cheeks while the steady thrum-thurm of a pump-boat lulled me into a sweet stupor. I remember quick showers at the end of sunshine-packed days, rushing to get back to my friends and cousins before dinner at the clubhouse, hoping to see a glimpse of that boy. And then there were the summers of university. Scrimping together pennies to plan beach trips with friends. Wardrobes chosen with care. The taste of ice-cold beer on a red-hot beach, like nothing else in the world. How sitting on the shore at night, and listening to the waves crash back and forth, could magically make any guy sound like a philosopher and a poet. A little of all that stays in my heart, and blips to life every time I pack a bag to the beach. And speaking of that bag…it needs my urgent attention. But I didn’t want to go before sharing this dish with you. I threw this together the other day when I was hankering for something “Spanish tasting” and had only the contents of my pantry and freezer to work with. – Sprinkle the chicken with salt and pepper, set aside. – Heat a large skillet over medium high heat then add a couple of swirls of olive oil. When the oil is hot, add the onions. Sauté until the onions start to soften. Add the garlic and sauté further until you can smell the garlic and they lose their rawness. – Add the chorizo and ham to the pan and cook until the chorizo renders some of its orange oil. Add the chicken to the pan along with the pimenton, thyme, and oregano. Let the chicken sear on one side, and then toss and add the olives and red peppers. Toss again, letting the chicken cook on all sides, and turn up the heat. Add the wine and let this bubble away until the alcohol has cooked off and the chicken is completely cooked. This shouldn’t take long. Taste and adjust seasoning. You may or may not want to add more salt depending how salty your ham and chorizo are to begin with. – Toss a couple of times more, remove to a serving platter, and enjoy! Although I can’t say that this is exactly a Spanish dish, it is one inspired by the flavors of Spain. Spanish chorizo is something I always like to have in stock, because I love it, for one, but also because, like bacon, it can make so many dishes that much better. Pimento de la Vera is another staple. It gives any dish it touches that distinct Spanish smokiness. I may be guilty of abusing and over-using it, but I can’t say I’m at all repentant. I love it and will use it as much as I want! The ham I actually had in my freezer, leftover from Christmas and already chopped. Olives and red peppers are also ingredients that play a large part in Spanish cuisine (and my pantry). I love this piled on rice (but of course) but I imagine it would also be good stuffed in a pita or rolled in a tortilla with some good squirts of hot sauce. And, for some reason, I keep thinking that this would be good on top of some plain canned white beans that have been drained. A supper straight from the cupboard. Alright. No more procrastinating. The last bits need to be packed and readied. Tomorrow we are off to this sunny isle for my brother-in-law’s wedding. I am raring to get that beer and put up my feet, if only for the weekend. That dish must taste wonderful! Ooooo, you did it… You made me long for summer sooo bad now!!! Have a fabulous time at your brothers wedding and in the meantime I'll be eating this dish. Looks awesome! 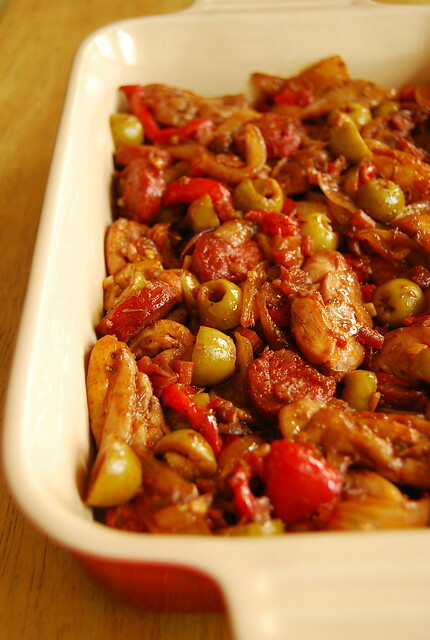 This looks like the perfect thing for using up the last bits of olive, red pepper, and chorizo in my fridge! Thanks for the notion and have fun! This looks yummy.Where do u buy pimento dela vera in manila? You think I can sub with harissa? I love how you write! Utterly delicious! That chicken dish looks the perfect baon recipe for next week. Maybe if I could add a dash of saffron too for that unmistakable flavour that I have always associated with Spain. Hi Simone! Thank you! We had a great time…weather was wonderful! Wishing I could send some palm trees and blue skies your way! Hi Corrine! You can find it in Terry's Selection 🙂 Harissa would give it a totally different flavor BUT delicious as well I am sure! Hi OompaWoompaGirl! Thank you for your nice words! Oooh saffron of course yes! Summer indeed is just around the corner. I'm sure it will be more exciting to have this recipe on summer day out on a picnic with the kids.